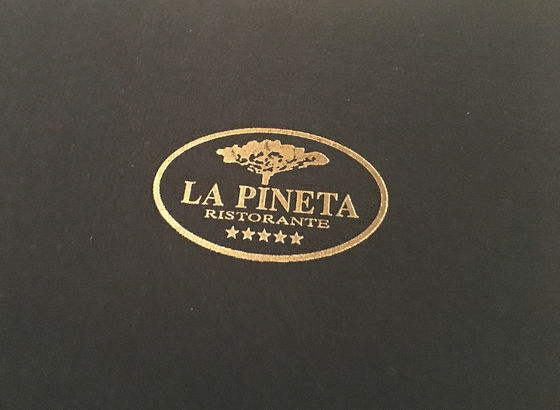 Ferragosto (Italian holiday), we finally got a reservation for the restaurant “La Pineta”. We have planned for one year to go there. The name of the restaurant was given to me by one of my very good friends (Thanks Patrizia!) and she really loves food, so you can trust her! The place is very unusual for a restaurant with one star from Michelin Guide. It's directly on the beach, I mean really on the beach where people lay in the sun and bath in the sea during the day. One part is side is dedicated to the beach bar and then behind a tiny white wooden door starts “La Pineta”. The restaurant is very cozy, not very formal, let’s say it’s a familiar restaurant. There are these little things... you understand immediately that behind this little wooden door the food is going to be very different. The restaurant is fully booked also because of the holiday. The waiter lighted our candle in a little silver candleholder. After checking the menu we decided to take the big tasting menu to try as most plates as we can. It was not easy to keep these decision once we saw the other plates on the menu! The wine card is amazing, big like a Bible. We chose a Vermentino from the area, a winery near Bolgheri, Tenuta del Tasso (I can't suggest you to visit the winery: first, because the wine is more expensive there than in Bolgheri and second: they are absolutely unfriendly!). The location, the beach, the noise of the sea, the lantern flying up to the sky to bring luck to people, the fireworks along the whole coast and the friendly Luciano Zazzeri makes it a perfect evening! 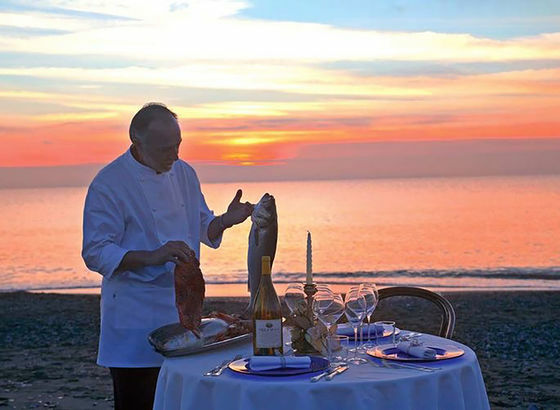 He loves the Langhe/Piedmont and he knows very well the very good cooks from this region. And last but not least: he also knows the wine produced by the friend that suggested me this restaurant: ”Malvira”! For sure we will return, but not in August! Too many people around! There are so many plates we still have to try! See also the video "Tuscany holidays - August 2016" and the article! See also the video \"Tuscany holidays - August 2016\" and the article!